fluffnflowers: Whoops! Slacked off on the blog! Whoops! Slacked off on the blog! I'm about as flighty as the big, white butterflies that are all over my gardens, these days, and completely forgot about adding to my blog. It's been so hot outside that I don't even have the excuse of being outside! My glads are in full bloom, and they're blooming in sequence again. 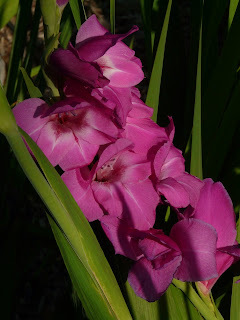 When we moved into this house, I had a bunch of mixed gladiolus that I dug and transplanted. Well, I don't quite know what I grabbed and didn't have them labeled, so now I have an assortment of varieties that bloom all summer. It starts out with the white and magenta flowers, then come the vibrant orange (just starting now), and then the pale, pale peach and pale pink, finishing up in the autumn with a bright red. There's genius in my forgetfulness, apparently, and I get a season of beautiful flowers that I can take inside or give to my MIL. 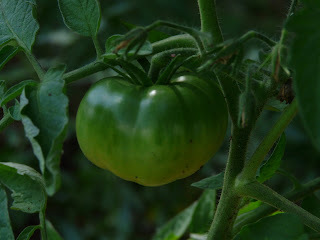 And, for the weekly tomato, report, here's a greeny off of one of my plants (can't remember which one) that's about the size of a tennis ball. I'll have to see if I can't get a picture of the white calf's heart -- very cool to look at.